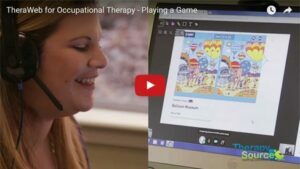 Online therapy is an emerging service delivery model that allows students to receive speech-language, physical, occupational and behavioral therapy via the Internet, from a certified therapist. Research has shown that, from a clinical and patient satisfaction perspective, outcomes emulate those of traditional face-to-face sessions. TheraWeb is Therapy Source’s easy-to-use platform for online, real-time therapy delivery. TheraWeb can be utilized across several types of therapy, including speech-language, occupational, physical and behavioral. With our blended in-person and online approach, Therapy Source can provide a solution that allows for in-person therapy balanced with the benefits of online therapy delivery. This allows for flexibility in caseload management – and enables, online therapists to reach remote schools, and fill in gaps caused by illness, school closings, and leaves of absence. From ASHA: "Telepractice is an appropriate model of service delivery for the professions of speech-language pathology [and audiology]." ...See more. From The U.S. Dept. of Education: "On average, students in online conditions performed modestly better than those learning the same material through traditional face-to-face instruction." ...See more.